Appam (அப்பம்) is a jaggery based sweet that is made in Tamil homes, especially for ‘Karthigai’ festival. Karthigai deepam (கார்த்திகை தீபம்) is celebrated on the eighth month of Tamil calendar, on the full moon day (பௌர்ணமி), which coincides with ‘Karthigai star’ (கார்த்திகை நட்சத்திரம்). This festival is a way of offering prayers to Lord Shiva, who is in the form of ‘jyothi or light’ (ஜோதி). It also marks the symbolism of bringing divine light into our lives. On this day, the houses are decorated with oil lamps, mainly in the front yard around beautifully drawn rangoli. In our native place, a bonfire with a palm trunk in the center (சொக்கப் பனை), would be lit in each temple. Certain special sweets are made for this festival, which include, appam (அப்பம்), athirasam (அதிரசம்), pori urundai (பொரி உருண்டை) and kadalai urundai (கடலை உருண்டை). Appam can be made in two different ways and I intend to share the easy method with you today. Though traditionally it is fried in ghee, I prefer to use oil for deep frying. Here we go.Of course, ghee appam is made on krishna jayanti day! Method: Remove cardamom seeds and powder them using the mortar and pestle. Mix jaggery with ½ tumbler (100ml) of water in a vessel. Heat it on medium flame while stirring with a spoon, till jaggery is fully dissolved. Switch off the fire and allow it cool. Later strain the liquid through a sieve to remove impurities, and keep aside. Mix atta, maida and rice flour in a bowl very well. Add cardamom powder and sesame seeds to the flour mixture. Now add the jaggery liquid and ½ tumbler (100ml) of water to the bowl. Mix the contents very well, taking care that no lumps are formed, till the batter is smooth and has pouring consistency (Fig.1). Heat oil in a kadai on medium flame, and once the oil is ready pour 1 small hollow ladleful of batter gently in the center of the kadai (Fig.2). As the batter gets cooked in oil, the edges turn light brown. At this stage, turn the appam over over using a sieve spoon (ஜல்லிக் கரண்டி). Continue to cook till the appam turns golden brown on all sides (Fig.3). 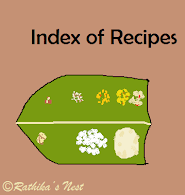 Remove the appam and place it on tissue paper to let the excess oil to get absorbed. Repeat the process till you use up the remaining batter. Serve hot as a snack or as part of festival menu.